This Caramel Apple Streusel Pie features a rich and buttery crust, an easy homemade caramel apple filling, and a toffee streusel topping. Taste: I was worried this would be way too sweet but it had a great balance of flavors. I am obsessed with the caramel apple filling, it is RIDICULOUSLY amazing. Texture: The pie crust is ultra flaky and tender yet holds up well to the hearty, rich, and thick filling. The toffee streusel topping adds a nice crunch to every bite. Ease: Not as easy as most of the desserts I post, but so worth the effort. The food processor makes quick work of the pie crust. Use a pastry blender if you don’t have a food processor. The “caramel” in the filling basically makes itself. Appearance: A little messy but still mouthwatering. Pros: This is a fabulous apple pie that will be eagerly welcomed on any holiday dessert table. Cons: Requires some time and patience. Lots of sugar. Would I make this again? The next time I need to make a pie for family or friends, this is the recipe I’ll use. Baking a homemade apple pie will make you feel like a kitchen champion. 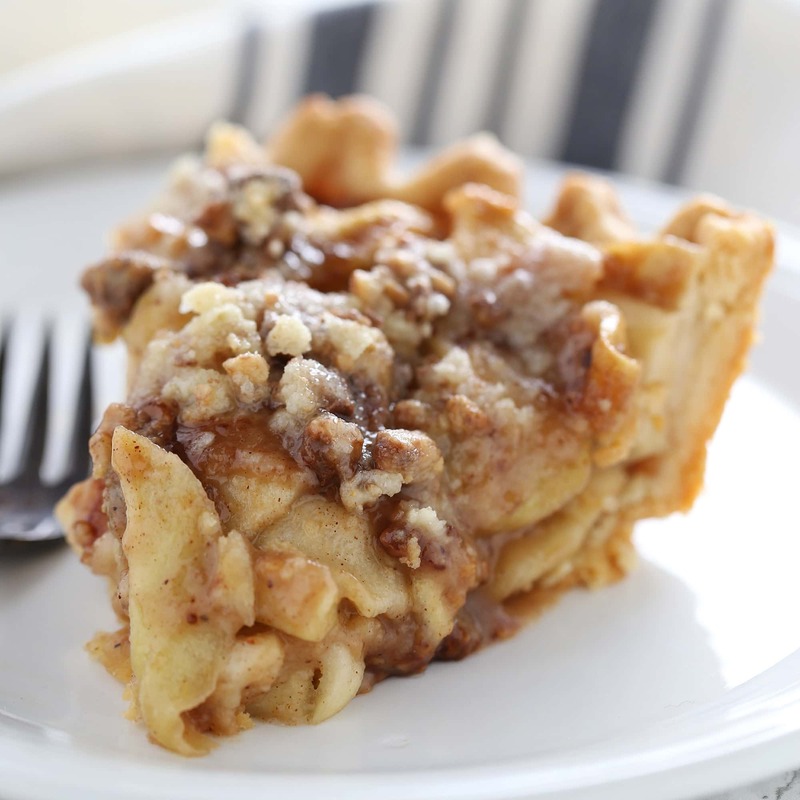 Making this Caramel Apple Streusel Pie will make you feel like a superhero. 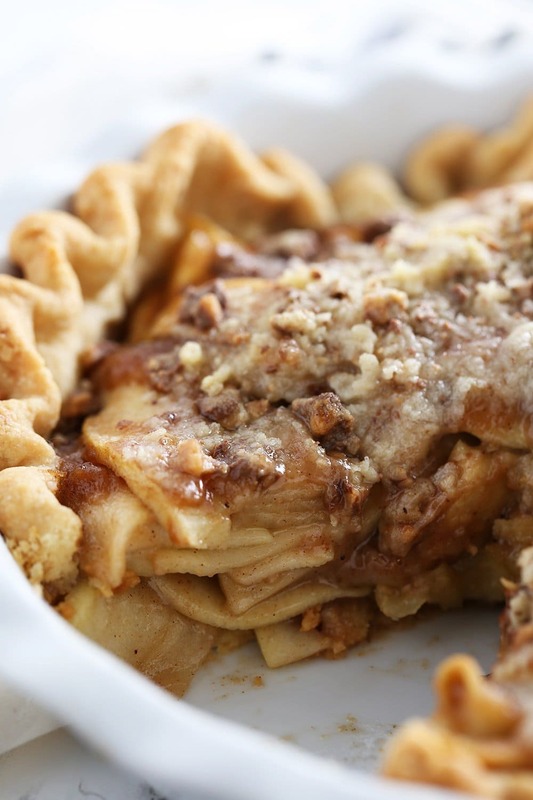 This pie is outrageously good and puts all store-bought apple pies to shame. A deep shame. Yes, making homemade pie dough and peeling and slicing a bunch of apples can be a pain, but I promise you it is SO worth it. Like, soooo worth it. You must do it the next time baking a pie is required (which should really be a weekly life requirement). Or the next time you want to wow your friends and family. Or put them in a sugar coma. Or just when you want your entire kitchen to smell like heaven on earth. This pie is definitely on the sweet side. If you happen to have ultra sweet and perfectly ripe apples, or you prefer a more mild sweetness, feel free to reduce the sugar in the filling slightly. If making homemade pie crust intimidates you, be sure to check out my new Best Ever Pie Crust recipe. There’s step-by-step photos and tons of trips & tricks in that post. This recipe was originally published in October 2013. It was updated to improve the recipe and add in new photos. In a medium deep mixing bowl, combine the flour, salt, and sugar. Add the butter, and cut into the flour using a pastry blender or two knives, leaving large chunks of butter remaining. Add the sour cream then drizzle the water, stirring until a rough shaggy dough starts to come together. If the dough holds together when pinched between your fingers, it’s good. If it doesn’t, drizzle just enough water until it does. Roll the dough out on a floured work surface. Keep turning the dough after every roll to ensure it doesn’t stick to the counter and is of even thickness. Roll out into a 1/8-inch thick 13-inch circle. Gently roll the dough up and around the rolling pin then unroll over a 9-inch pie tin and press into the tin. Trim the dough, leaving a 1-inch overhang. Crimp or decorate edges and pierce the bottom of the crust all over with a fork. Freeze for 30 minutes, or until very firm. Make ahead: At this point you can place the pie tin (preferably a disposable one) in a zip-top bag and store in the freezer until ready to use. Defrost in the fridge overnight. Remove the pie shell from the freezer and place a double sheet of foil over the shell, pressing the foil gently across the bottom and up the sides of the pie. Place 2 cups pie weights or dry beans over the foil. Bake until the pie crust is dry and light in color, about 20 minutes. Carefully remove the foil and weights and continue baking for another 12 minutes, or until just turning golden. Remove pie and maintain oven temperature. Combine all the ingredients except the butter in a large bowl. Melt the butter in a large heavy skillet over medium-high heat. Add the apple mixture and cook until the apples begin to soften, about 8 minutes. Pour the apple mixture into the pie crust. In a medium bowl, combine the flour and sugar. Cut the butter into the flour with a fork until coarse crumbs form. Stir in the toffee bits. Sprinkle over the apple mixture. Wrap the edges of the pie crust with a crust shield or foil. Bake the pie for about 35 to 40 minutes, or until the crust is golden brown. Let cool until just barely warm. Serve. Tessa, this is incredible!! So pretty and I love the streusel and addition of caramel! Oh my Tessa! This looks absolutely delish. I think I may have to make this very, very soon. I adore apples and caramel together. I can’t wait for fall pie baking and this is what I’ll make first! Love this, Tessa. This pie looks beyond incredible Tessa! Ooh! I’m excited to make this one for sure because I LOVE caramel apples. I have been known to snack on apple slices and the Fleur de Sel caramel dip from Trader Joes year round just because… Yep, I will be making this because it’s right up my alley and it looks incredible too! Just made an apple pie with streusel topping. It was great…but now I will have to try it with the caramel ingredients in the filling and the toffee in the streusel top. It sounds like it will make the pie even better! Btw, thanks for the comment about it won’t be too sweet. I would ordinarily worry about this. I would love to have a big slice of this right now, just gorgeous! 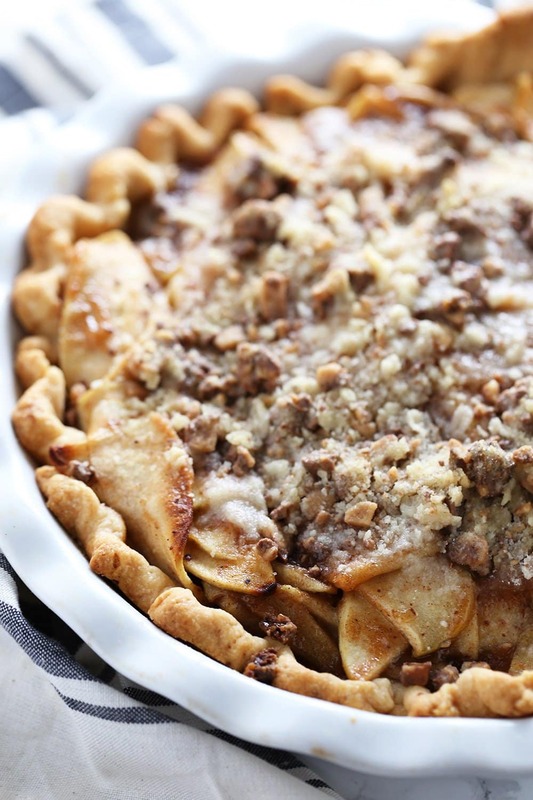 tessa, you’ve got a great blog (and this pie looks incredible!). i’ve always enjoyed reading along. just a slightly annoying feature though are the ads that pop up when you visit the site. they take over the screen and not only can you NOT click them away, they take over viewing your site. then they disappear and it’s not an issue. thought i’d let you know since it really takes away from the experience of reading your blog. Thanks for the feedback! I’ve been trying to figure out where that ad is coming from (I have multiple ad providers) and haven’t had any luck yet. Please know I’m working on getting it removed! Wow! This is just the pie I use from here: http://www.foodnetwork.com/recipes/food-network-challenge/caramel-apple-pie-2003-1st-place-apple-recipe/index.html. I will try your addition of corn starch next time! I made this over the weekend. I don’t like typical apple pie but loved this. Sweet but delicious! Looks yummy! You mention covering pie shell with double layer of foil but then you say to put pie weights over parchment. Which one is best to use? Can’t wait to make this! Whichever you have on hand should be fine! This was absolutely incredible!! I made the pie yesterday for dessert. We had this delicious creation with vanilla ice cream. Every one was raving. My husband said ” you can make this anytime” Thank you once again for another winning recipe! thank you for this recipe, I like your last reason for baking this pie from scratch, that is, aromatherapy! Great excuse, at least for me and love your crust walk through too! I made this to take to a dinner party. It was so delicious. Everyone loved it! I’m going to add it to my Thanksgiving dessert line-up. I had to use Greek Yogurt in the crust since I didn’t have any sour cream, but it worked out just fine. The crust was so buttery and flaky. Definitely my new pie crust recipe going forward. 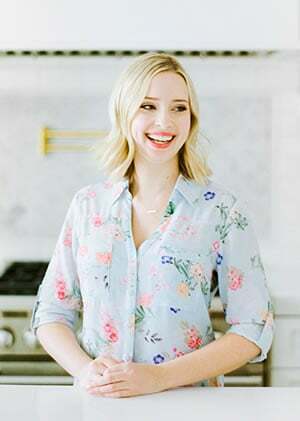 Thanks so much for all the wonderful recipes you post! Do you think this is something I could assemble the night before and then pop in the oven the next day, or would the bottom of the pie get soggy if I do that? Looks amazing, regardless! Thanks for the recipe! The pie would get soggy unfortunately. You could freeze it instead 🙂 Assemble the pie fully, double wrap in plastic, and then freeze for up to 1 month. Let the pie partially thaw at room temperature for about 1 hour, then bake as directed by the recipe, adding about 10 minutes to the baking time, or more as needed. Hey Tessa! I love all the recipes I’ve tried of yours and they always turn out perfect! Nice easy instructions and the videos sure help! So thank you for that One question; in this filling do you think I could add a couple of tablespoons of a nice bourbon and not change too much the consistency ? Thanks ! Love, love, love this recipe! It is without question, the BEST apple pie I’ve ever tasted! I made this pie using Honey Crisp and Granny Smith apples. Flavors, texture, etc… were just perfection!!! !